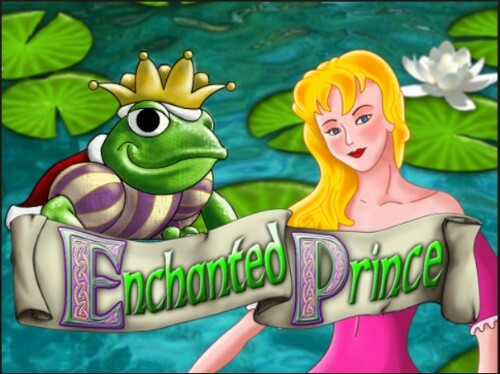 Play Enchanted Prince Slot with 500 Free Spins! Enchanted Prince slot game is made by Eyecon with 5 reels, 3 rows, 25 pay lines and a 94.9% RTP. This slot offers a Free Spins Bonus feature when 3 frog symbols appear in the reels. Anyone who has any knowledge of fairy tales and fables should understand the story of the prince and his unfortunate fate of turning into a frog. Well, Enchanted Prince slot is actually an online slots version of this tale, brought to life by the superstar developers at Eyecon gaming! This 5 reel, 3 row, 25 pay-line slot game brights this fairytale to life with a whole lot of magic and action. So are you ready to free prince charming and break the spell? But beware you are gonna need to kiss the toad! Eyecon has spared no expense when it comes to additional features that alter basic gameplay in many ways. One should expect wild symbols here, wilds obviously substituting for other symbols on the reels (specifically the scatters). That’s right, scatter symbols are here too, offering many ways for one to throw around symbols on the reels thus producing up to 25 free spins depending on how many of these scatters you can align in the winning pay-lines. Free spins are worth their weight in gold here, free spins offer multipliers that can elevate your scores if given the right love and attention, keep that in mind for future reference! Rose Slots is one of the very best places to enjoy Eyecon games such as Enchanted Prince Slot, Fluffy Favourites, Fluffy Too, Shaman's Dream and many more. Eyecon games share a similar set of mechanisms and features including bonus rounds, free spins, wilds and scatters to create a familiar gaming experience across their portfolio of games. Pucker up, you might just end up saving a certain prince from embarrassment. The Enchanted Prince fable was also adapted into a 1988 Film named "The Frog Prince". This wasn't a blockbuster hit, but it did help to visualise the story for a much wider audience. Enchanted Prince slots are powered by Eyecon an online slot software provider, this company is founded just before the turn of the century and has a strong reputation for exciting slot games. Eyecon the company has produced many other games including Irish Luck online casino, Stampede, Kingdom of Cash, Fluffy Too slot game, Fluffy Favourites, and Secret Garden among many others. Enchanted Prince demo slot is a well-illustrated slot game with Prince Charming worthy graphics. Every symbol in this slot reflects a different numerical value in terms of payouts, a value that can then be extracted depending on how many of these symbols you have within that winning pay-line. Players should expect a lot of frog-like symbols to appear on the reels, and yes this includes Lilypads. There is also a variety of lower value symbols which follow the telltale signs of an online slot by being in the shape of various playing card symbols. Free Games are awarded the Scattered Frog Symbol. You need to collect 3, 4 or 5 of them in the reels to trigger 15, 20 or 25 Free Games respectively. Within the game, the free spins can also be retriggered up to fifteen times. The Crown is the wild symbol and substitutes for all other symbols apart from the Scattered Frogs. Payline wins with the Crown will be doubled. Like many other online slots by Eyecon, the game comes with the gamble feature where you have a 50 / 50 chance either doubling your prize or losing it all - that's why they call it gamble! This feature is optional after every win. The RTP of the Enchanted Prince Slot game is 94.9%, which is a little bit lower than some of the other Eyecon hits such as Fluffy Favourites. 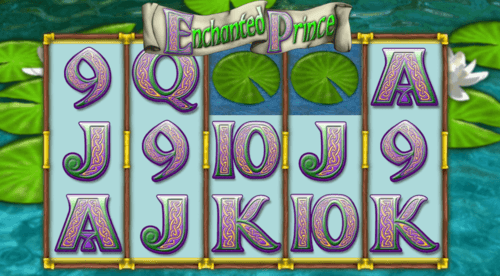 There is also a Progressive Jackpot version of this game named Enchanted Prince Jackpot. Our Froggy friend above who is also the Prince Charming in waiting is the game's Free Spins Icon. If you land 3 or more of these symbols in the visible reels then you will be awarded the games free spins. During the Free Spins, the games can be re-triggered up to 15 times. 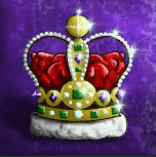 The Crown is Enchanted Prince Slot's Wild symbol. It doubles all wins that its part of and acts very much like the pink elephant in Fluffy Favourites. The Princess is the highest paying symbol in the game, with a whopping 2,400 multiplier of the line bet if you get 5 Princesses in a row on a pay line. The Enchanted Prince Castle is the second highest paying symbol in the game, awarding a 1,800 multiplier of the line bet. Remember this could be doubled if one of these castle symbols is replaced by the Wild Crown symbol. The enchanted prince story is based upon the Frog Prince fairy tale which is made famous by the Brothers Grimm. It is thought this story goes all the way back to Roman Times, and it is thought to be a camouflaged attack at the emperor Nero. In this story, a princess becomes friends with a Frog, after noticing him deposit a gold ball into a nearby pond. After noticing this, the princess then decides to kiss the frog, thus turning him into a handsome prince charming. Interestingly enough there is also a Russian version of this fairy tale which sees the male and female roles reversed, with a male prince discovering a beautiful female princess. This story has also inspired a string of enchanted prince films and movies such as "Enchanted", which is a 2007 film by Disney. When selecting Autoplay you must also choose a loss limit before it will begin.